The demand for gas genset was generated from applications such as power plants, oil & gas fields and industrial sectors. This has been primarily due to substantial investment in manufacturing industries and power plants. Furthermore, growing environmental concerns and stringent emission regulations for using diesel gensets as power backup source in various countries such as China, Japan and the U.S. have driven the demand for gas gensets during the past few years. 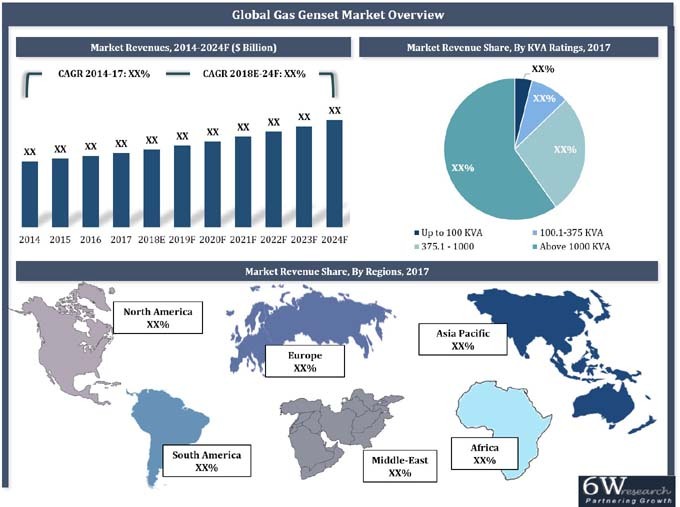 The North American region captured majority of the revenue share in the global gas genset market, followed by the Asia Pacific and Europe, on account of rapid deployment of gas gensets in industrial and power generation applications. Further, the increasing adoption of environment friendly solutions, rise in green manufacturing practices in industries would drive the growth of the gas genset market in the region. The report comprehensively covers the Global Gas Genset Market by types, applications, regions and countries. The report provides an unbiased and detailed analysis of the on-going trends, opportunities/high growth areas and market drivers which would help the stakeholders to device and align their market strategies according to the current and future market dynamics.